This post is sponsored by Amazon. It’s Friday! You’ve had a long week and cannot wait to get home to snuggle up with your partner and enjoy the weekend. Then you remember…it’s your anniversary, his birthday, Father’s day or some other special moment. You have so many errands to run. You need to pick up the dry cleaning, drop off a package at the post office and complete the week’s grocery shopping before you can even think about what to buy your significant other. Will there ever be enough time in the day to do it all? Luckily, you can cut down on the errand time by using Amazon.com. The site offers gift cards to purchase just about anything with card designs for virtually any occasion. You can even upload your own photo and schedule delivery for up to one year in advance, eliminating any last-minute stress! Your man deserves something special and what better way than by letting him make his own choice. It’s easy to order a personalized gift card online. The best news is that you can send it for free with one-day shipping. Let your man know how proud you are to be with him. With so many options to choose from and the convenience of buying online, you can do this in the matter of minutes and in the comfort of your home. 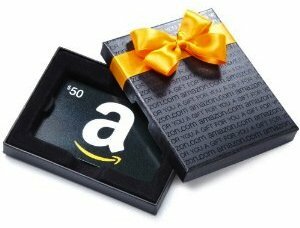 Lucky for you, Amazon.com is giving away a $50 gift card to one CupidsPulse.com reader! Try it out for yourself. All you need to do is enter the giveaway below. GIVEAWAY ALERT: To enter for a chance to win a $50 Amazon.com gift card, go to our Facebook page and click on the “like” button. Then, leave a comment under our Amazon.com giveaway post and let us know that you want to enter the contest. We will contact the winner via Facebook when the giveaway is over, and he or she will have three days to respond back with his or her contact information. The deadline to enter is 5 p.m. EST on Monday, October 22. Good luck!